Freeport's Quirk 4th highest paid woman exec in U.S.
Fortune magazine lists Kathleen Quirk, Executive VP, CFO, and Treasurer of Freeport McMoRan Copper & Gold, as the 4th highest paid woman executive in the U.S. In 2007 her total compensation was $16.3 million. 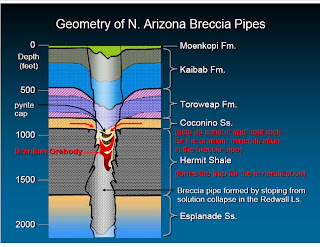 Arizona has an estimated 600,000,000 acre-feet of brackish groundwater at depths of less than 1,200 feet according to a talk given at last week's joint AIPG - AZ Hydrological Society conference in Flagstaff. Edwin McGavock of Errol L. Montgomery & Associates out of Prescott, described the locations and characteristics of some of the largest brackish water resources as well as costs and barriers to developing them. Two challenges are energy costs for desalination and the disposal of the resulting brine. Apparently, Arizona classifies all aquifers as "Drinking Water Aquifers" including those where the salinity of the waters exceeds that of seawater. 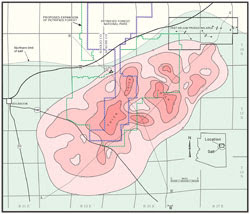 McGavock concluded that since "brine injection in deep saline aquifers is often the best, or only, feasible method of brine disposal, the ability to utilize Arizona's abundant brackish groundwater resources may depend on a reappraisal of the aquifer classification system in the state." Interior argued that the House committee was 3 members short of having a quorum and therefore the resolution was not binding. Since the resolution passed in June, companies filed four new mining claims and four notices for uranium exploration were accepted by BLM in the lands designated by the House committee. The Grand Canyon Trust and the Western Mining Action Project joined CBD as plaintiffs. German blogger geoberg.de has compiled a list of 101 geoblogs. I'm reposting them here to help spread the word. There are a lot of talented people sharing fascinating and well-written ideas and news out there. The role of geoblogging is still in its formative stage. It's exciting to see how quickly it's growing and diversifying. Thanks to Callan Bentley at NOVA Geoblog for spotting this list. The Geo Factor by Ron Exler - Blog about GIS, GPS etc. 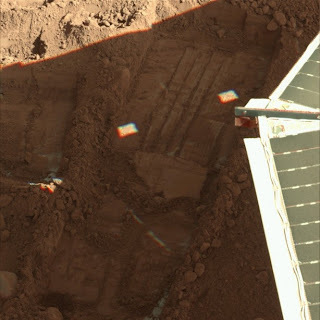 Stratamodel Blog by Tom Bell - Blog about the field work of the Stratamodel Inc.
NASA extended the mission of the Phoenix Mars Lander today, saying it will operate the lander until it dies in the cold and dark of the Martian winter. The mission has lasted 120 days so far, past the initially planned 90 days. The Lander team continues to dazzle the scientific community with new discoveries and observations. The price of copper dropped to $2.9065 a pound in response to Congresses defeat of the credit bill. Analysts fear a credit shortage will slow growth in the U.S., Europe, and China. China has accounted for 40% of the demand growth for copper recently. Copper hit a record price of $4.2605 on May 5, but is down 25% the past quarter, the most ever. The new View Hotel that is opening in December in Monument Valley is drawing attention from travel writers across the country. 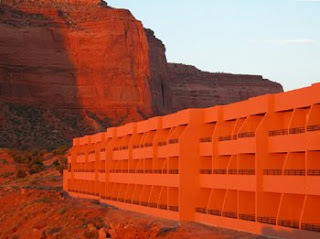 The hotel, which describes itself as the only one located inside Monument Valley adjacent to the Monument Valley Tribal Park Visitors Center, prides itself as meeting "green” building standards and environmentally friendly operating procedures. The building offers panoramic views of the the East and West Mitten Buttes on the Arizona side of Monument Valley Navajo Tribal Park. News from Mars continues to pour in. 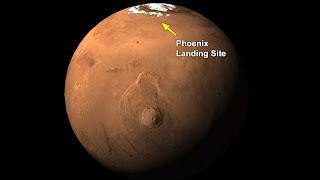 The Phoenix Mars Lander team at UA today announced they detected snow falling from clouds about 2.5 miles above the landing site, but vaporizing before it hits ground. The other news is that the Lander soil experiments found evidence of calcium carbonate and clays that only form in the presence of liquid water on Earth. The implication is that the Phoenix's landing site was once wet. The Phoenix Mars Mission has been named a finalist for the Arizona Governor's Celebration of Innovation's Innovator of the Year Award in the academia category. The Phoenix Mars Mission was selected as the 2007 Innovator of the Year in the same category. The Innovator of the Year Awards will be presented Nov. 13 at a gala at the Dodge Theater in Phoenix. The annual awards event, which honors technology and innovation leaders statewide, also includes a technology showcase featuring the finalists' innovations. The UA's HiRISE camera on NASA's Mars Reconnaissance Orbiter has spotted hundreds of deformation bands that are thought to have served as conduits for ancient groundwater flow in equatorial Mars, according to a new study published in GSA Bulletin by Chris Okubo of the USGS in Flagstaff and co-authors. The Lunar and Planetary Lab at Univ. of Arizona released 1,005 new images from the Mars Reconnaissance Orbiter's HiRISE camera, totaling 3.4 terabytes. The images cover the period of April - July, 2008. UA has released 7,100 HiRISE images so far, totaling 26.9 terabytes. There is a section on the HiRISE Web site with 3-D photos that are being used to evaluate potential landing sites. New mining truck "more mind-boggling than vegan pork rinds"
At last week's MINExpo in Las Vegas, even many of the most seasoned veterans were clamboring around the big machines that filled the convention center. Boys and their toys. So, it's fun to see what happens when newbies see the scale of the equipment. The folks at Wired magazine are suitably blown away by Caterpillars new 795F truck, in an online article titled, "Big Honkin' EV Hauls 345 Tons." They're particularly impressed with the fact that it's dual diesel-electric. They call it "more mind boggling than vegan pork rinds." One of the late-night movies that impressed me as a kid was the 1936 "Invisible Ray" in which Boris Karloff builds a machine capable of reaching out into space to capture light waves that left Earth millions of years ago. With this amazing device, he watched as if in high orbit, as a meteor of rare composition struck western Africa in the distant geologic past. As I became a geologist, I occasionally thought how wonderful it would be to have Karloff's machine so I could watch the entire geologic evolution of the Earth from above and fill in all the gaps in our knowledge. Now, Ron Blakey and Wayne Ranney have essentially built their own time machine to examine the geologic history of the Colorado Plateau, just as if you were capturing Karloff's invisible rays from the last billion plus years. "Ancient Landscapes of the Colorado Plateau" just published by the Grand Canyon Association, contains more than 70 paleogeographic maps of the Colorado Plateau (and sometimes half the globe) that give the reader the sense that you are seeing images captured throughout geologic history by some paleo-astronauts. Ron and Wayne have compiled a wealth of detailed stratigraphic and other data to provide a substantial technical basis for their recreations. 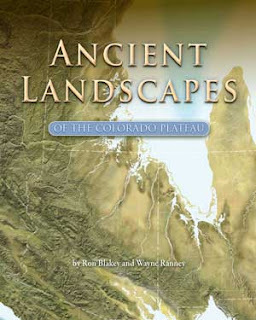 What makes this book unique and so spectacular, is the authors application of modern geologic analogs to the limited information in the geologic record to create plausible and striking images of the ancient landscapes of the region. It seems that every geologic formation on the Plateau has it's own map. There are more than another 100 illustrations and photos that tie the maps to the outcrop. I have never seen paleogeographic maps that are this exciting and thought-provoking. The artistic quality is superb and I especially like that all the modern political boundaries are subdued enough that you can easily ignore them to better view the geology. When you want to put it back in perspective I found it only takes a second or two to refocus and see where you are. This is a bold interpretation of the history of the Colorado Plateau and one that will fascinate the casual reader and dazzle even the most experienced Plateau expert. The Center for Biological Diversity issued a press release late today saying that they, Grand Canyon Trust, and Sierra Club Grand Canyon Chapter reached a settlement agreement with the US Forest Service and VANE Minerals over uranium exploration on national forest land south of Grand Canyon National Park. 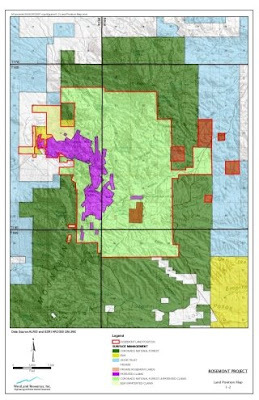 The settlement requires the Forest Service and VANE Minerals to withdraw the drilling approval previously issued and to undertake a full Environmental Impact Statement process prior to any renewed effort to drill at the sites. Video is of Vane geologist Kris Hefton at one of the uranium-bearing breccia pipes in northern Arizona. 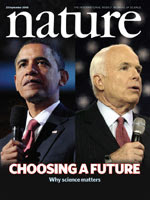 The journal Nature published Barack Obama's answers to 18 science-related questions; John McCain's campaign declined to respond. Answers to additional questions (on topics including biosecurity, the nuclear weapons laboratories and US participation in international projects) can be found at http://www.nature.com/uselection. Nature noted what McCain has said at other times on these topics. On the topic of evolution, Obama said "I believe in evolution, and I support the strong consensus of the scientific community that evolution is scientifically validated. I do not believe it is helpful to our students to cloud discussions of science with non-scientific theories like intelligent design that are not subject to experimental scrutiny." Nature reported that "McCain said last year, in a Republican primary debate: "I believe in evolution. But I also believe, when I hike the Grand Canyon and see it at sunset, that the hand of God is there also." 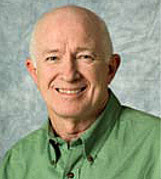 In 2005, he told the Arizona Daily Star that he thought "all points of view" should be available to students studying the origins of humanity. But the next year a Colorado paper reported him saying that such viewpoints should not be taught in science class." The candidates answered another set of questions prepared by ScienceDebate2008. Responses from McCain and Obama are presented side by side for comparison. They address water and energy among specifics on health care, space, and general questions on scientific intergrity, innovation, and funding. This has to be the most intense focused scrutiny the scientific community has ever placed on presidential candidates. And the most attention offered by the candidates? 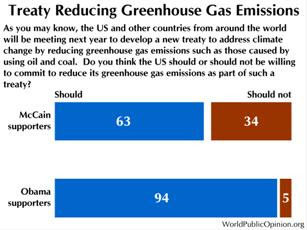 The World Public Opinion group examined the views of supporters of senators Obama and McCain on energy and climate change and concluded there is a lot of agreement between the two camps. 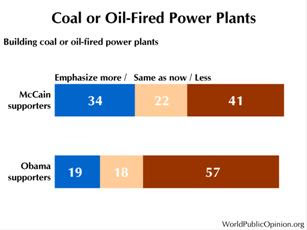 A couple areas where there are bigger differences are in building coal or oil-fired power plants, and in the U.S. committing to a global treaty for reducing greenhouse gases. The geoscience community is actively engaged in raising issues and recommendations for the next President of the U.S. 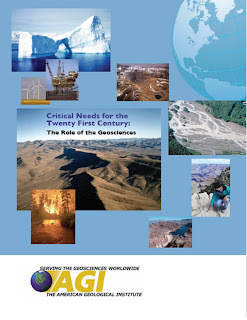 The state geologists, through AASG, have also prepared a short briefing of key issues facing the nation that the geoscience can help address. AASG addresses water, energy, natural hazard, climate change, and resource issues. This is the first time the geoscience community has taken the initiative in the transition. In the past, professional societies might weigh in with a recommendation or endorsement of possible candidates for heading geoscience programs in federal agencies, but not much more than that. The next step is to get these materials to each campaign's transition teams (yes, the teams are in place and working away on their post-November plans). The Utah Geological Survey has produced a Google Earth fly-by video tour of the Wasatch fault and posted it on YouTube. It briefly shows the fault within the Intermountain Seismic Belt that extends into northern Arizona. The 10-minute video is not only engaging, the narrative is fully understandable by non-geologists without dumbing down the information. This is circulating among state geologists across the country as a great example of how we can better communicate with our constituents. The State of Utah is showcasing it. But unfortunately, we are hearing from a number of other states that not only are their computers blocked from viewing or uploading materials to YouTube, a number of them are even prohibited from viewing Google Earth. The study concludes that water systems such as canals "cut across stream channels, disrupting the flow of water and sediments from tributary networks to the main channel. In pristine streams, sandbars and other patches created where these sediments collect are often ideal places for nutrient cycling. By starving streams of their historic supply of this material, canals accidentally alter the way nutrients are cycled in stream ecosystems." The authors report that "surface and subsurface hydrologic network is short circuited with water entering the channel from well and canal sources, and water leaving by evaporation, seepage, and canal redirection." The National Academies released Science and Technology for America’s Progress: Ensuring the Best Presidential Appointments in the New Administration, advising the next President on filling up to 80 key high-level S&T appointments. The report recommends an accelerated process for appointing and confirming S&T leaders, particularly the President’s top advisor on S&T matters, whose role should be returned to a more central place in White House decision-making. The Director of the USGS is one of the 80 positions identified. A number of other positions could be filled by geoscientists. The National Geospatial Data Agency (NGA) is collecting control data now in preparation for capturing 1-foot resolution aerial photos along the Mexican border region. California and Arizona are high priorities. 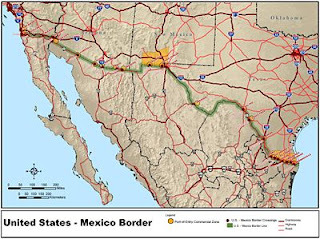 Photos will be taken in a swath extending 30 miles on the U.S. side and 10 miles on the Mexico side. Final permission to fly over Mexico is pending, but NGA hopes to fly the region in October and process the films this winter. The aerial photos will be publicly available, according to a briefing we got at the Arizona Geographic Information Council's Data Committee meeting this morning in Phoenix. A sister project along the U.S. -Canada border is nearly complete. There's a very powerful description of a talk at MINExpo yesterday that concludes "everything that could go wrong is going wrong" with global copper production. Problems include power shortages in Chile, lack of trained personnel, higher development costs, constraints on access to water, higher prices for oil, sulfuric acid, and labor, and bottlenecks in getting production equipment. This should lead to at least maintaining copper prices. Asarco has asked a U.S. District Court judge to award it $10.2 billion in damages and stock from Grupo Mexico. Asarco wants Southern Peru stock worth $6.7 billion they argue was improperly stripped from the company and award it $3.5 billion in monetary damages. Interestingly, the bankruptcy judge said in a separate action that creditors have to be allowed to vote for either Grupo Mexico's and Asarco's reorganization proposals, but he has not decided if the votes will have any meaning. A Reuters interview with Freeport McMoRan CEO Richard Adkerson indicates that the company's strong cash flow and sharply reduced debt means the company is moving forward with exploration and development projects worldwide, despite the turmoil in the credit markets. The Mining Foundation of the Southwest will fund an Outreach Program for the Arizona Department of Mining and Mineral Resources museum in Phoenix. The grant will fund an Education Curator for a period of three years and assumes the State will step in and fund the position after that. The MFSW Education Curator will conduct classes on minerals and mining in schools and community colleges throughout Arizona. Given the State's increasing budget shortfalls, getting new State funds in the next year or two will be a real challenge. The Governor just today put out an announcement describing a 2.8% reduction in the number of state employees since a hiring freeze was imposed this past spring. DMRR director Madan Singh has told AZGS that we will have to move our Phoenix branch office out of the DMRR building when the new curator is hired. We are considering a couple options for relocating the AZGS office. Freeport McMoRan Copper and Gold is #10 on the Fortune magazine annual list of the 100 fastest growing companies in the U.S. and the only one from Arizona. Fortune said Freeport's revenues increased 92% last year to over $20 billion. The American Institute of Professional Geologists presented awards at a reception in Flagstaff last night, wrapping up their annual convention, held in conjunction with the AZ Hydrologic Symposium. AIPG Arizona Chapter President Barbara Murphy received the Award of Honorary Membership, given for exemplary record of distinguished service to the profession and to the Institute. I was greatly honored to receive the John T. Galey, Sr., Memorial Public Service Award, given for service to the public. The past two days, I've talked with dozens of miners, from geologists, to engineers, prospectors, suppliers, consultants, and so on. There is an overall sense that the mining industry is prospering with a long term bright futu re. But that's tempered with an underlying concern about the current economic crises and a frustration that the nation does not recognize or appreciate the challenges mining faces in maintaining America's economy and national security. 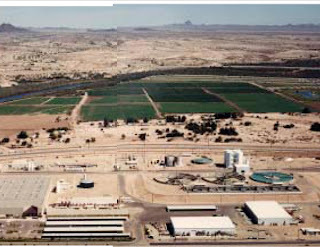 One shorter term problem in Arizona is the high price of sulfuric acid used in heap leach operations. Companies are eagerly looking for new supplies of sulfur. Attendance at MINExpo here in Las Vegas is an indication of strong demand and high prices for many mineral commodities. It appears to me that every square foot of exhibit space has been taken by vendors in the endless LV Convention Center. At yesterday's opening session, coal was center stage at the National Mining Association's panel on the state of the industry. The forecast is for 1.2 billion tons of U.S. coal production in 2008, up from 1 billion tons in 2006. Exports of coal are expected to triple to 85 million tons. One coal company rep who stopped by the State Geologists (AASG) booth, told me that a lot of it is going to China, which relies on coal for 80% of its electric generation. It was noted that the U.S. has 27% of the world's coal reserves, an amount roughly equal to Saudi Arabia's share of world oil reserves or Russia's share of world natural gas. At yesterday's Arizona Geothermal Working Group meeting in Tucson, the CEO for Navopache Electric Cooperative, Dennis Hughes, described their plans to build a geothermal power plant in the Nutrioso area of east central Arizona, capable of generating 50 MW of electricity. If successful, this would be the first geothermal power plant in Arizona. Geothermal consultants are reviewing the area's potential now for the Co-op. A 1985 well found 174 degree water at a depth of about 4400 feet. Dennis says they will likely have to drill to about 9,000 feet to find sufficiently high temperatures. The Co-op has leased 6 sections in preparation of starting development. A transmission line passes right over the site. Among the points Resolution president David Salisbury makes is that block caving is the only viable mining technique that will work in the operation. A Congressional hearing was held earlier this summer on the legislation introduced by U.S. Senator Jon Kyl for the land exchange. Rio Tinto, majority owner of Resolution,previously committed $652 million to the pre-feasibility study towards developing the mine. The Arizona Geothermal Working Group met in Tucson yesterday and agreed on preparing a strategic plan as a critical step in developing the state's geothermal resources. Paul Morgan, professor emeritus at NAU, laid out a compelling case for determining the state's potential and what needs to be done to take advantage of it. Paul runs the Group's web site, but when funding for it runs out in a year, AZGS has agreed to serve as a long-term online repository to make sure no information is lost. AZGS is building a geothermal page for our Web page now. Arizona has few ground source heat pumps, no electrical generation from geothermal, but a few commercial direct-use applications, mostly for greenhouses. Arizona has a reputation for dry soils that are not well suited for heat pumps but consultant Jim Witcher [right] noted that similar types of settings in New Mexico and West Texas have successful heat pumps in operation. Amanda Ormand, who organized the meeting, is contributing to a study to delineate renewable energy resource zones that will affect placement of new transmission lines. The Prescott area Water Advisory Committee got it's first look on Wednesday at the regional groundwater flow model for the Big Chino and Verde River watershed [right, ADWR]. USGS hydrologist Jim Leenhouts told the group that the model will require a lot more data to make the model useful and much of that data is not available. The Northern Arizona Regional Groundwater Flow Model is intended to be used on varying water scenarios to predict the impacts on the aquifers. No date was set for when the model will be completed. AZGS will begin quadrangle-scale geologic mapping in the region this fall under the Statemap program with the intent to provide greater geologic framework information to constrain groundwater models. NPR's Science Friday broadcast from the UA in Tucson yesterday. They covered what planetary scientists know about Mars and what remains to be discovered. Guests included Peter Smith and Alfred McEwan from the UA Lunar & Planetary Laboratory and William Hartmann from the Planetary Science Institute in Tucson. In the second segment, they covered both chile peppers and the reasons southern Arizona is close to heaven for astronomers. Host Ira Flatow interviewed Adam Block from the Mt. Lemmon SkyCenter and Douglas Isbell from Kitt Peak. Meetings will be going on across the UA campus during the next week to discuss the process of developing proposals for department consolidations and realignments. University president Robert Shelton holds a town hall on Sept. 23. Dean Joaquin Ruiz will give his views on possible reorganization of the College of Science on Sept. 24 to staff with a meeting on Sept. 26 for classified and appointed staff about the continuing state budget cuts and the reorganization of the College of Science. After the OneGeology meetings in Rome last week, I took two days off to visit Pompeii and Herculaneum outside Naples. Both cities were destroyed by the eruption of Mt. Vesuvius in 79 A.D.
Pompeii was filled with ash falls and many of the residents died from poisonous gases. that flooded the walled city. We took the Circumvesuviana metro line to Ercolano and walked less than a kilometer down the city streets to the Herculaneum excavation. The top photo shows the old sea front of the city, with arched boat alcoves to the left. Note the vertical wall on the right is the excavated lahar deposit. The lahar carbonized wood in the houses and buildings of the city but preserved tiles, mosaics, frescos with a freshness not found elsewhere in the old Roman Empire. The lower photo shows frescos and exquisite tile work in a Herculaneum home. There is virtually no mention of the cause of the burial of either city in the ruins. Above Herculaneum and next door to the Pompeii ruins are modern bustling communities, forming part of the greater sprawling Naples region, all of which circle the base of this still active volcano. It last erupted in 1943 with minor ash and gases. Tomorrow's issue of Science carries a technical comment that rebuts the interpretation of Victor Polyak and associates published last March, that used cave deposits to track water-level declines and attributed them to downcutting of the Canyon. 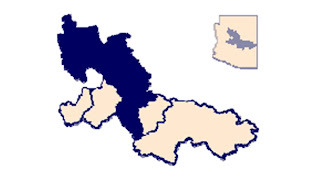 The Polyak article received widespread attention in the geologic and general news media. Our team determined instead that "water-table declines at these sites were more likely related to local base-level changes and Miocene regional extensional tectonics." They conclude that geologic evidence shows the Colorado River arrived in the western Grand Canyon region about 5-6 Ma. A second critique of the Polyak interpretation is authored by Joel Pedersen and his colleagues, and raises complementary concerns. The rebuttal by Polyak et al, comes down to them arguing that they see no absolute data that negates their interpretation, so therefore, they must be right. Not the most compelling argument, but read the whole debate yourself. 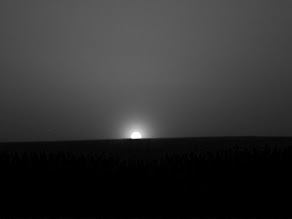 The Phoenix Mars Lander photographed a series of dust devils on Sept. 9. The start of a video sequence can be seen in the upper left of the photo. Follow the link below to see it move across the landscape. "The dust devil visible in this sequence was about 1,000 meters (about 3,300 feet) from the lander when the first frame was taken, and had moved to about 1,700 meters (about 5,600 feet) away by the time the last frame was taken about two and a half minutes later. The dust devil was moving westward at an estimated speed of 5 meters per second (11 miles per hour), which is similar to typical late-morning wind speed and direction indicated by the telltale wind gauge on Phoenix. This dust devil is about 5 meters (16 feet) in diameter. This is much smaller than dust devils that have been observed by NASA's Mars Exploration Rover Spirit much closer to the equator." 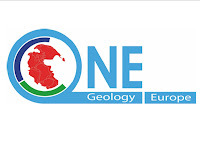 I'm just back from the kick-off meeting of the OneGeology-Europe (1G-E) initiative in Rome, a 29-nation project to build a continent-wide geoscience data network, comparable to the Geoscience Information Network (GIN) that AZGS is heading up in the U.S. The project, funded by the European Union, invited me to be on their advisory board to help ensure our two networks will be integrated and interoperable. It’s pretty clear that we are in agreement on all the major concepts and directions of the two data networks. We are discussing ways to link the two projects across all the working levels. There is also a companion EU project for GIS data and capabilities, the European Spatial Data Infrastructure Network (EDSIN) run by Eurogeographics, that looks to be a great collaborator. In a related note, we finished negotiating budget revisions and completing the standard paperwork on the NSF funding for GIN, so we got approval two days ago to launch our 3-year project. We are organizing a workshop on GIN for the GSA annual meeting in Houston, for Saturday, October 4 to expose GIN to the geoscience community and invite wider participation. I hoped to be blogging from Italy but the pace was so busy that I could barely keep up with email let alone post about what was happening. But I did take two days after the meetings to visit the ruins at Pompeii and Herculaneum, buried by eruption of Mt. Vesuvius in 79 A.D. When I catch up, I plan on sharing some observations and photos about this. CNN's SciTechBlog says the UA's Phoenix Mars Lander is sure to be further extended after the first extension runs out at the end of September. 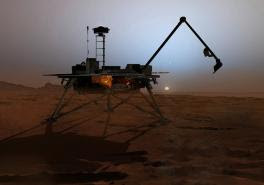 The Lander is in the Martian arctic where the sun set for the first time in its mission on August 21, to rise again about half an hour later. It's expected to continue operating until the Martian winter freezes it sometime in November. 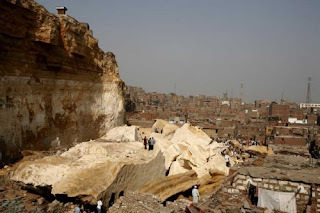 Dave's Landslide Blog site has a large number of photos and a description of the deadly landslide in Cairo in today: "The death toll in the rock slide at El Doweiqa in the Manshiet Nasser slum of east Cairo is slowly creeping upwards. At the time of writing it has exceeded 30 people, but unfortunately as the image [right] shows the likelihood is that it will be much higher once these huge blocks have been shifted (if ever)." He also includes an article from the local newspaper in 2006 warning that the people who lived at the base of the slope feared they would die from a landslide that was expected. This is a powerful story about the threat of natural hazards anywhere. I stumbled across this blog looking for news about the landslide and am amazed at the rest of the blog posts and photos Dave [Petley] has about landslides all over the world. I'm bookmarking the site. USGS' Water Science for Schools was selected as one of the 10 best government Web sites by Government Computer News, based on information and services delivered. The citation said "USGS’ educational site on water, for instance, offers almost everything a student, or anyone else, would ever want to know about the wet stuff. And we mean everything. Opinion surveys and quizzes can help visitors think further about water issues. This modest site has drawn as many as 1 million visitors a month. It’s also a communal project. Much of the material available on the site is presented in as many as 60 languages — Chinese was added recently. Volunteers did most of the translation work. With the growing scarcity of fresh water becoming a pressing issue not just for the United States, this site can be an invaluable resource not only for students but also for people worldwide." Mining forces us to "pay attention to what our lifestyle does to the planet"
Option one; follow the current American method and make the miners go dig in third-world countries, where the environmental restrictions are lesser. With this option, our backyard stays pristine(er), but the earth get dirtier overall. Option two; dig the hole, get the copper for our new laptops and houses, pay attention to what our lifestyle does to the planet and think about it when we chose to consume. Have the effects in our face, and the mine right here where we can be sure it will be done cleanly. Option three; mine the largest, purest copper deposit in the area; our houses. If you don't want to mine the earth for minerals, take your copper wires out of your walls, the ceiling fans and alternators and put them in a pile at the curb. If you don't want copper, you shouldn't be made to have any.